Place five 4×4 mini cheesecake springform pans on a baking sheet. Add pecans to a food processor (or blender) chop until finely diced. To the food processor with nuts, add in butter, honey, 1/2 teaspoon of cinnamon and a pinch of salt. Blend until everything is mixed and the “crust” holds together a bit. Evenly distribute pecan crust among five springform pans. Press the crust down on the bottom of the pan, do not go up the sides. Bake crust for 5 minutes. Remove and let sit. In a stand mixer using the whisk attachment, add cream cheese, brown sugar, and vanilla extract. Whisk until the cream cheese is smooth (no lumps). Next add in pumpkin puree, eggs, ground cinnamon, nutmeg and cardamom. Blend until all ingredients are mixed and the cheesecake mixture is light and fluffy. About 4-5 minutes. 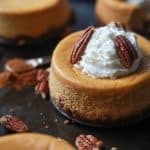 Evenly distribute pumpkin cheesecake among the mini springrform pans on top of baked pecan crust. Bake cheesecake for 35 minutes. Leaving the cheesecakes in place, turn off the oven, and leave the door open for 1 hour. Remove the cheesecakes from the oven and place in the refrigerator to cool.